Hunters across the parish, state and country have turned the tables on a PETA Facebook promotion that was apparently geared toward their protest campaign against hunting. 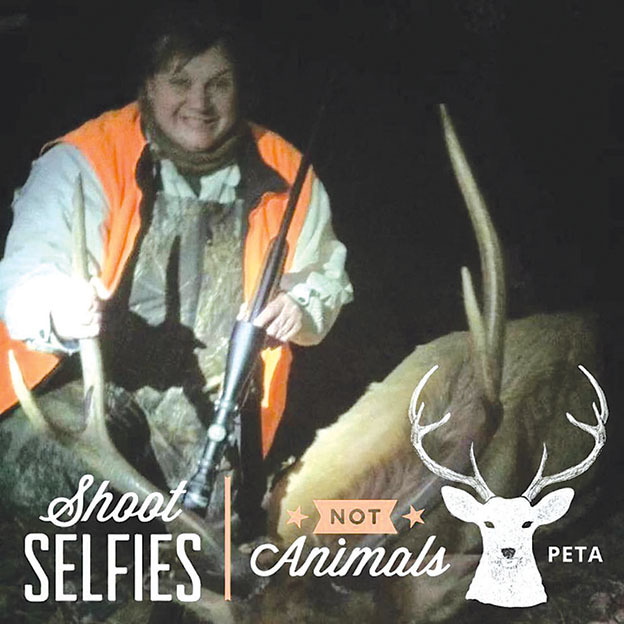 PETA introduced a frame featuring the words “Shoot Selfies not Animals” and a rather impressive buck to Facebook users. The frame took off like a bullet – in an epic backfire. Hunters are using the frame to show off their best shots as their profile pictures. Facebook feeds, and especially the hunting groups, are being inundated with the frames, all featuring hunters and their harvested animals. PETA missed the target and hunters took a stand in grand style. For most hunters, it is not a sport. It is a way of life, a way to put food in the freezer and on the dinner table and a way to keep Mother Nature in balance. No matter how you look at it, the harvest of animals for human consumption is the most basic of conservation methods. Hunters also contribute more than $1.6 billion a year for conservation programs. Hunting season across most of the nation begins in only days, like archery season in Colorado, or a few weeks, like archery season in Louisiana. For more information on hunting as a conservation effort, visit www.rmef.com and click on the conservation link. To show off your best frame, load up the comment section below this story.